Raise your hand if you’re in full swing with crazed holiday baking. ME ME ME! Some of the tastiest little morsels of cookie-goodness have come out of my kitchen this week. I’m super excited to share a brand new cookie recipe with you later in the week.. This Sweet Potato Casserole is one of those classic dishes that originates in the Midwest but is enjoyed by people all over. It is SO easy to make and it is SO delicious. This dish is typically made for Thanksgiving meals, but goes great with any holiday or any-day meal. I think I've mentioned Sammy's obsession with anything sweet. We will be staying at a few different campgrounds in the coming weeks and the only thing he needs to know is...will we be able to make a fire so we can make s'mores? Over the weekend we celebrated our youngest cutie's sixth birthday. It seems impossible that six years have passed since that precious first moment we met him. And boy did we celebrate! So many of his friends came and the kids had a blast. So I'm a bit off today. One of my boys was very sick and up a lot during the night. He had a minor surgery yesterday, which went great, but his stomach did not agree with the anesthesia. There is nothing tougher on a mama than having a sick/sad/hurting kid! He is resting now. I should be resting, too, but I have posts to write and treats to make! This is the last of my fudge posts. I love Swiss Maid Fudge! I could throw it into just about everything and be a happy girl. These were great as bars, but they were also delicious as an ice cream topping. More on that in a bit..
Preheat your oven to 350 degrees F. Coat an 8x8-inch square baking dish with cooking spray and set aside. Add 6 tablespoons of melted butter and process until crumbs become moistened. Divide the crumbs in half. Press half of the crumbs into the bottom of the prepared baking dish. Bake in the preheated oven for 18 to 20 minutes, or until the marshmallows are lightly browned. Let sit at room temperature for 2 hours before serving. 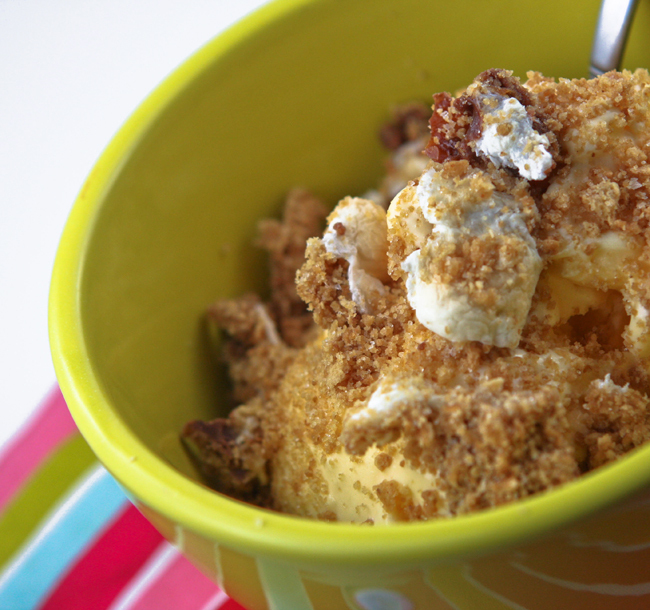 ..crumble over ice cream. Yum! A caramel surprise in every bite! 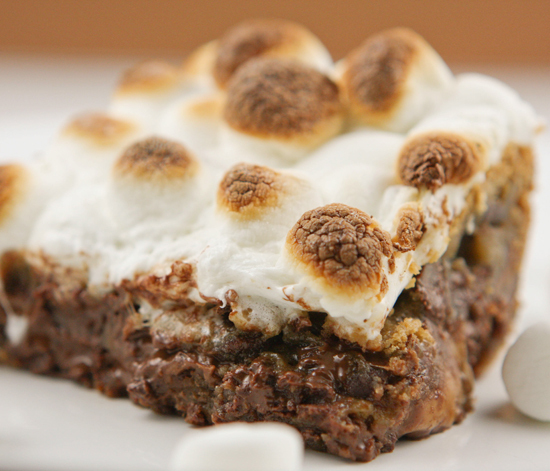 This upgrade to brownies with melted marshmallows is such a tasty treat. 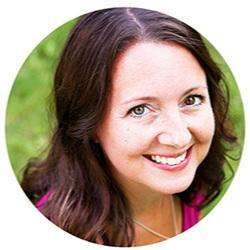 I have started and stopped writing this post about two dozen times, for a thousand different reasons. I won't get into that, but I will tell you that I came up with this brownie recipe during a recent bout of insomnia. I woke up at 3:00 a.m. and started doing my usual stressing/worrying/thinking. I decided to turn my thoughts into something productive, so I started thinking about food! And what better food to ponder than brownies? I have been loving the "stuffed" treats lately, Chocolate Crinkle Cookies with a Rolo Surprise and Double Chocolate Cookies with a Peppermint Surprise! SOOO (after some pondering) I came up with the idea of brownies stuffed with one of my all-time favorite candies, Rolos. I needed just a little something extra, and roasted marshmallows seemed like the perfect thing to throw on the top. Most treats that I make end up being shared with my coworkers. These brownies did not get shared with my coworkers. My husband and I ate the ENTIRE batch by ourselves. Every last crumb. I can't even tell you how sinfully delicious they were. These are well worth being awake in the middle of the night! 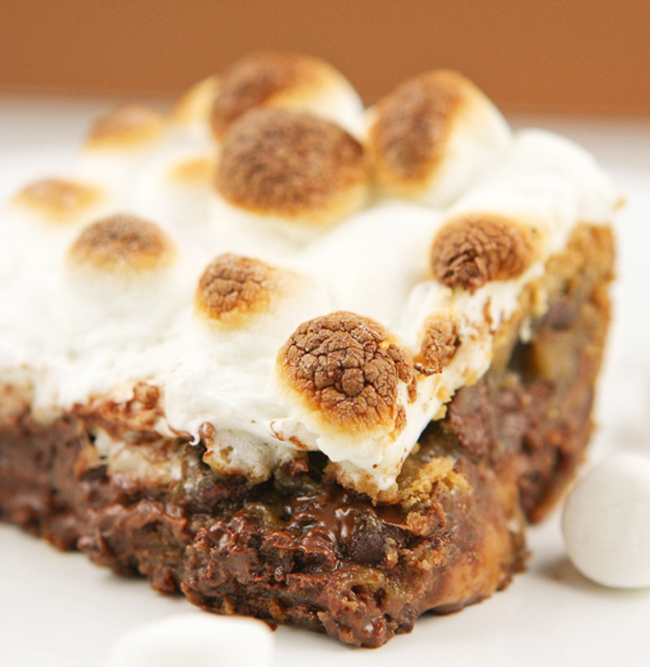 Rolos are stuffed INSIDE of these irresistible, marshmallow-topped brownies. Preheat oven to 350 degrees F. Spray a 9x9-inch baking dish with cooking spray. In a medium bowl, combine flour, baking soda and salt. In a large bowl, combine butter and brown sugar. Add egg, milk and vanilla and mix well. Add flour mixture in two batches until just combined. Stir in chocolate chips. Spread half of the mixture evenly in prepared baking dish. Top with a layer of Rolos and the rest of the batter. Bake for 25-30 minutes, or until top is lightly browned. Preheat broiler. Top brownies with marshmallows. Place in oven for 2-3 minutes, or until marshmallows are toasted. Let cool completely before serving. Have you ever tried crack? Yeah, me either. After eating these brownies, though, I feel like I would probably be less addicted to crack. I mean, how can that not be the case with brownies, peanuts, marshmallows, Reese's peanut butter cups, chocolate, peanut butter and Rice Krispies all present in a single bite? !